There's toe-tappin' fun for the whole family in this collection of kid-friendly ukulele rock. Kids from ages 2 to 92 will dig these catchy, cross-generational tunes! 2. What Will You Be? Santa Barbara based singer-songwriter James 'Ukulele Jim' Clark is on his way to becoming local rock star among the young and young at heart. His 2009 debut CD "Ukulele Jim's Authentic Down Home Marital Aid" was a favorite among adult fans, but the laid-back feel of the music and pleasant lyrics also resonated with his younger listeners. Now his much-anticipated follow-up CD "Ukulele Jim's Jumping Flea Circus" is aimed directly at children while still appealing to grown-ups. 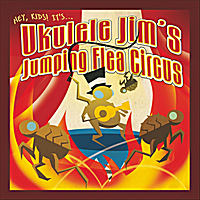 Scores of parents have already reported that "Ukulele Jim's Jumping Flea Circus" has become their children's all-time favorite CD with heavy rotation at home and in their cars and, fortunately, the parents are enjoying grooving and singing along to it too. "Ukulele Jim's Jumping Flea Circus" plays like a version of Sgt. Pepper for children, opening with the first song about a traveling circus of singing fleas. This whimsical tune sets up the rest of the album as part of a loose concept of watching a performance of musical vignettes. It all comes together by the later inclusion of a lullaby reprise about the fleas settling down in their beds for the night. Each song on the album captures the essence of being a kid through lyrics that reach to the heart of children's imaginations and danceable arrangements that get kids jumping. The album explores a variety of musical genres, including acoustic folk, rock, calypso, country and blues, all unified by Ukulele Jim's lilting voice and playful songwriting style. Even his own kids get in on the act, appearing in several songs as they interact with their father through humorous banter and singing along. Also included on the CD as a bonus track is the nostalgic "Let's Have An Old Fashioned Christmas" which preceded the album as a single. As a modern singer-songwriter whose style has been described as "the soulfulness of James Taylor combined with the pop sensibilities of Jack Johnson," Ukulele Jim's music shows great attention to the craft of songwriting and creating sophisticated musical arrangements. Ukulele Jim is also Santa Barbara's best-kept secret because his rise in ukulele music coincided with his starting a family, which is currently keeping him relatively close to home. From his home studio he uses the convenience of the Internet to collaborate with musicians from all over the world, creating an international 'virtual group' free from geographical boundaries. This collaborative freedom allows Jim to give a full band sound to catchy, emotive songs that bridge the gaps between pop, rock, country, folk and–with this newest album–children's music.